This graphical scientific calculator purely written in C programming language. It uses small functions to draw buttons on the screen and perform scientific operations like conversion, logrithm, and other operations. Every operation can be performed using the mouse buttons as well as keyboard. 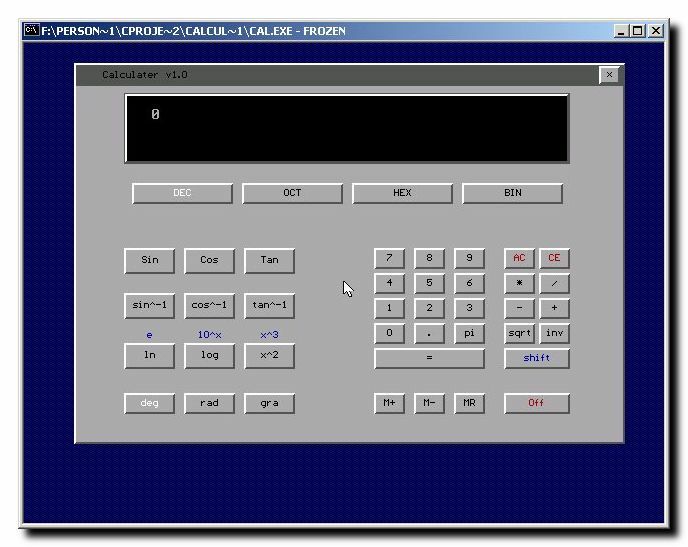 It can perform almost all the functions shown on the screen except few functins which will be implemented in the next version of this calculator code. Before compilation make sure you change the line 460 ( initgraph(&gdriver, &gmode, “f:\\tc\\bgi”);) to show the actual path of the graphics library on your machine i.e. bgi folder of your turbo C/C++ compiler installation. Here are the few functions this calculator performs. It performs the conversion from decimal to (Binary, Octal and Hex decimal) values. Calculates Sign, Tangant and Sec, Coses, Cot. Log, Antilog, Exponent, power values. Also it can store numbers in memory, find the square root of any number. This software is provided by MYCPLSU with the source code, you are free to use this code as you need and change the code.